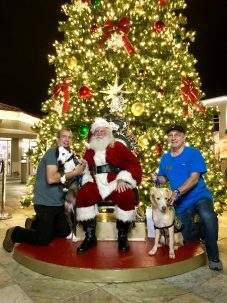 On Thursday, December 13th, Naples’ dog lovers brought their furry, four-legged family members for photos with Santa at The Village Shops. 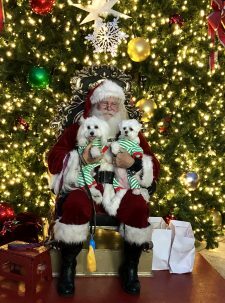 Dogs of all breeds, shapes, and sizes were dressed to impress wearing everything from holiday pajamas, Santa hats, antlers, bows, and more. The sound of playful pups could be heard in the background, as the line for Santa quickly grew longer. The dogs were the stars of the show all evening long with puparazzi taking photos from every angle. 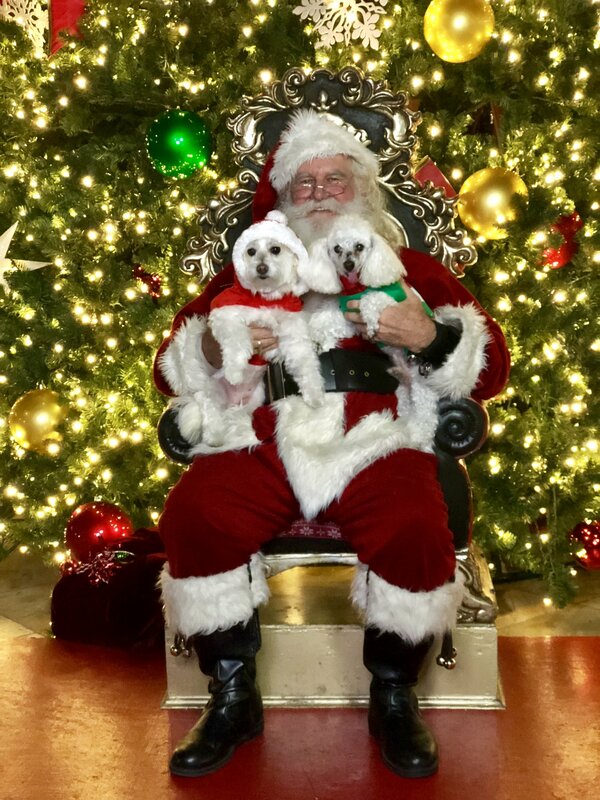 After being rewarded with a tasty treat from Santa, the dogs and owners received their complimentary printed and emailed photo. 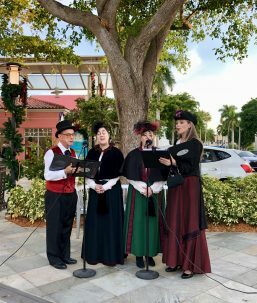 The Dickens Carolers opened the night singing many popular holiday carols. 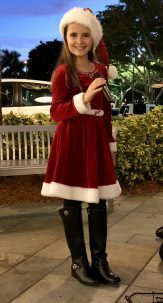 The carolers were then followed by Naples’ own, Kylie Gust, a young singer with a passion for charitable causes. 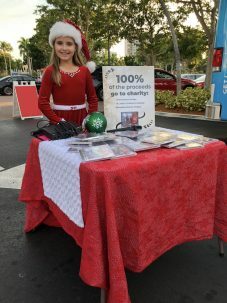 This holiday season, Kylie recorded an album with 100% of the proceeds being donated to her three chosen charities: The Humane Society, St Jude’s and Wounded Warrior Project. 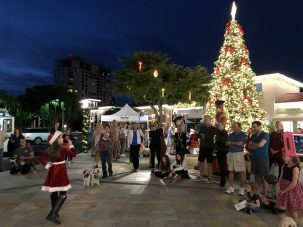 Immediately after singing the first song, a crowd gathered around singing along to the festive favorites. As Kylie performed tracks from her album including “I Want a Hippopotamus for Christmas”, “Silent Night”, “Where Are You Christmas”, her CDs rapidly sold. 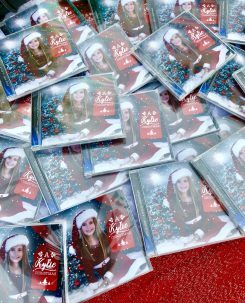 Kylie’s album is available throughout the holiday season and can be purchased online by visiting https://www.kyliegust.com. 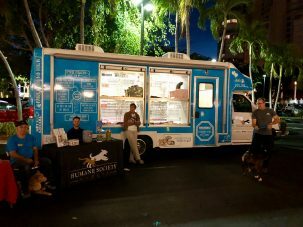 The Humane Society mobile adoption bus, volunteers, and pets were also present at Santa Paws. The bus was filled with loving pets looking for fur-ever homes. 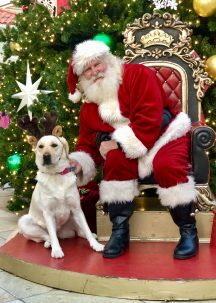 The adorable, adoptable animals interacted with guests and even received their own special photo op with Santa Claus. *There are only 10 shopping days left until Christmas.The Village Shops retailers and restaurants have you covered for fashionable favorites and gift cards to cross off everyone on your list. Be sure to place receipts from any Village Shops retailer or restaurant in the drop boxes located on the south side of The Village near Pratt’s Shoe Salon or the north side near Panache. Now through Sunday, December 16th, The Village Shops will be donating 10% of all receipts collected back to the Humane Society of Naples.